Sharktopus was one of the better performing SyFy original movies and helped lead the charge into the fray of combination animals running amok on an unsuspecting populace. As it’s also a Roger Corman production, you know that every last dime is going to get squeezed out of the film. Hence two sequels! Sharktopus vs. Pteracuda is the first of these, essentially the Empire Strikes Back of the trilogy. 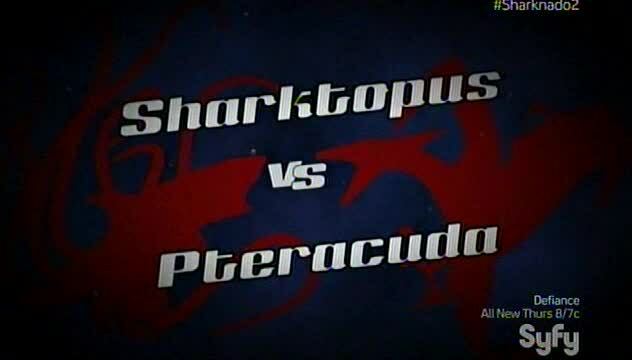 But Sharktopus is dead, how can there be another Sharktopus movie? Easy! Thanks to a handy recap of prior events, we learn that Sharktopus was preggers! A shark egg sack is among the pieces of Sharktopus that float out to sea and are quickly caught in a net for a boat being chartered by a Latin America amusement park that has sent it out to find cool stuff in the ocean, and Lorena Christmas discovers the baby Sharktopus 2.0, which she begins to raise. I’ll make you watch every episode of King of the Nerds, or else! On the polar opposite side we have another genetically engineered creature built as a weapon with Pteracuda, which has the flight powers of a pterodactyl and the underwater strength of a barracuda. While talk mentions that the US military is probably going to settle on its drone program over these genetically manipulated monstrosities, Dr. Rico Symes is convinced that he can create a creature that is more destructive in air and at sea that can outclass the drones. Things look well, until Pteracuda is almost immediately hijacked and goes berserk. Good thing she was wearing her life jacket! Dr. Rico Symes (Robert Carradine) – Dr. Rico Symes is the amoral genius creator of Pteracuda, doing the whole project in secret to the world and his own company. Symes must then stop his creation after it is hijacked, but refuses to stick his neck out while doing so. He founded Symodyne, which we know is bad because all companies that end in -dyne are evil! Not only that, but Dr. Symes kidnaps Lorena at gunpoint and drags her into his unmarked white van. Robert Carradine is awesome here, he is like an evil Lewis Skolnick on steroids! Lorena Christmas (Katie Savoy) – Not a Ph.D., hired directly out of college by her uncle, who owns the aquatic theme park. Raises the new Sharktopus from a newborn, and recognizes its intelligence, and was trying to condition it to be nonviolent. I wonder if she’s named after Dr. Christmas Jones from The World is Not Enough. “Ham” Hammerstein (Rib Hillis) – Leader of the security team hired by Dr. Symes as insurance in case something goes wrong with Pteracuda, and the only member to make it through the opening sequence alive. Weirdly loyal to Dr. Symes for most of the flick until he’s betrayed one too many times. Enjoys harpoon-based weaponry. 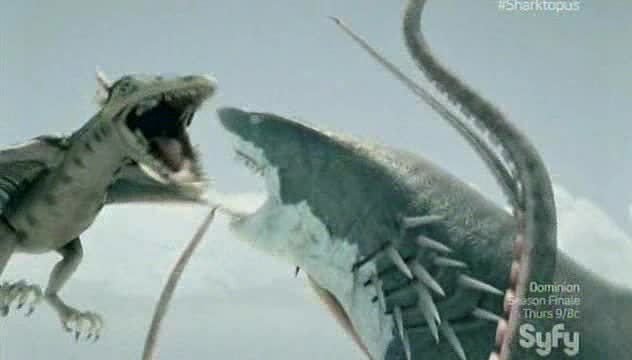 Sharktopus (CGI) – Sharktopus is really Sharktopus 2.0, either Son of Sharktopus or Daughter of Sharktopus. It doesn’t really matter for movie purposes. Just how Sharktopus got pregnant in the first place is not addressed. Raised in a theme park, Sharktopus is unable to throw off its created purpose as an alpha predator/weapon, and thanks to a control circuit lodged in its head, is sent out to fight Pteracuda. Pteracuda (CGI) – Designed as a replacement/improvement of drones, Pteracuda is hijacked and soon is killing lots of people, leading its creator to go to extreme methods to hunt it down. Which means it fights Sharktopus! The hacker who takes control wants Pteracuda to attack a nuclear power plant. 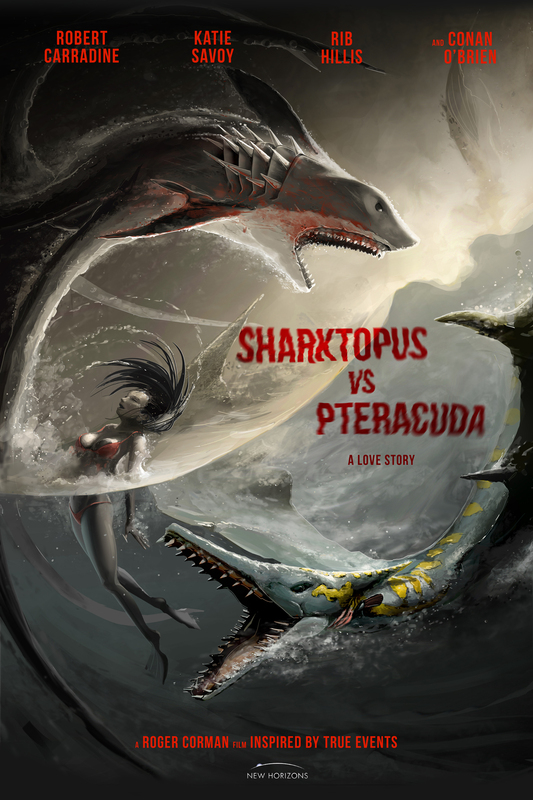 Sharktopus vs. Pteracuda – Sunday, August 2 at 9PM – In this new Roger Corman movie, the child of Sharktopus goes toe-to-toe with the latest science experiment “Pteracuda” – half Pteradactyl, half Barracuda – in a battle for monster supremacy. A production of New Horizons Pictures, the movie stars Robert Carradine (Django Unchained) and Katie Savoy (Living with Models). And, yes, Conan O’Brien is in it!